The Gite is part of a very old stone building which has it’s history dating back to the 17th century. We have renovated it ourselves and have made use of the unique spaces to create a feeling of stepping back into another time. It has changed over the centuries to accommodate different uses. Evidence of it being used as recently as the mid 20th century as a place to cultivate silk worms. 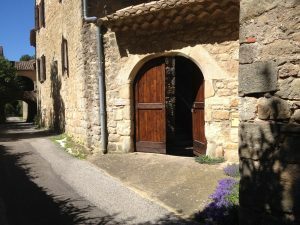 It is nestled in a hamlet called Les Monèdes overlooking the village of St. Paul le Jeune (07460) and is situated between the two market towns of St. Ambroix and Les Vans, at the very southern most point of the Ardeche, and on the edge of the Cevennes. 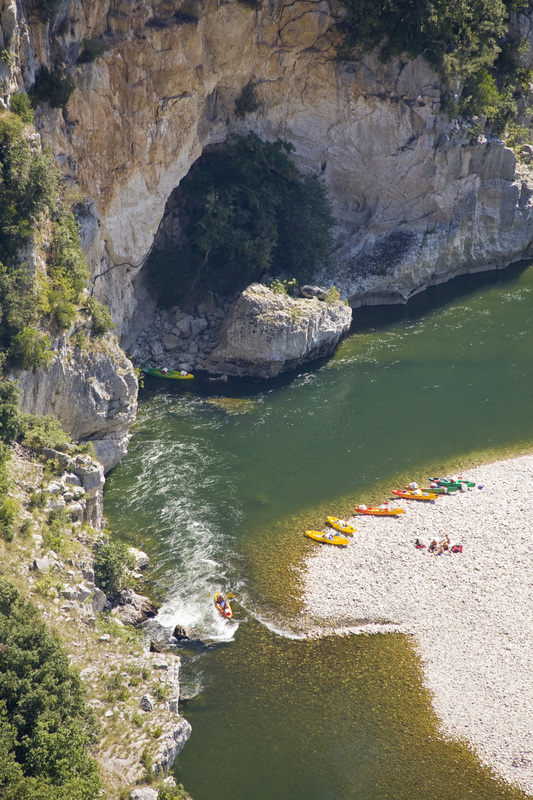 The famous Ardeche Gorge and the spectacular Pont d’Arc are 30 minutes drive away offering canoeing, kayaking and river swimming. 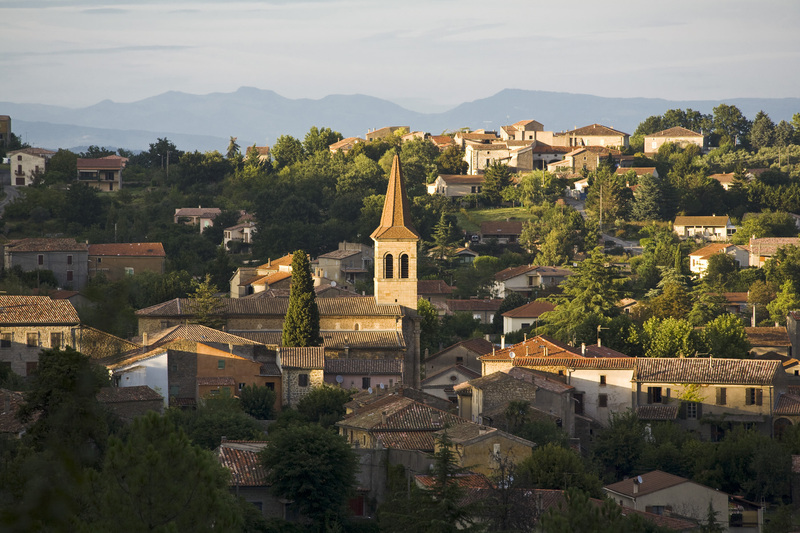 The historical towns of Nimes, Arles, Avignon and Montpellier are all within easy reach. Close by is the Pont du Gard and the Mediterranean sea is just two hours drive south. The countryside is ideal for outdoor activities such as walking and off road cycling. The village lies on the border of two very different geological regions: one boasting fascinating limestone outcrops, natural potholes and cave systems to visit; the other offering miles of hilly forest and beautiful river valleys. The view from the balcony overlooks the village and the hills on the opposite side of the valley. The village provides everything you would need including; bakers, butchers, outdoor market, restaurant, pizzeria, bank and chemist. St. Paul le Jeune is situated between the two market towns of St. Ambroix and Les Vans. The historic towns of Nimes, Arles and Avignon are within easy reach. Nimes and Arles famous for their magnificent amphitheatres and alleyways crowded with boutiques and cafes, Avignon for its Palais des Papes. 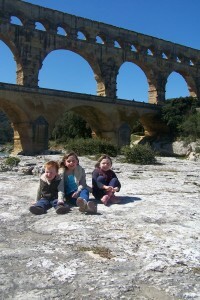 Close by is the Pont du Gard, the impressive aqueduct, built to supply the Romans in Nimes with water. Nearby towns hold weekly markets where you will discover many colourful stalls selling locally produced fruit and vegetables alongside baskets of olives, nuts and spices. The cafes provide a welcome break from shopping, a chance to relax with a coffee and croissant and watch market life. The historic town of Barjac holds a bi-annual antique market, during the Easter weekend and around the 15th of August, and is just 20 minutes drive away. Slightly further afield is the town of Uzès, with it’s bustling Saturday & Wednesday market. 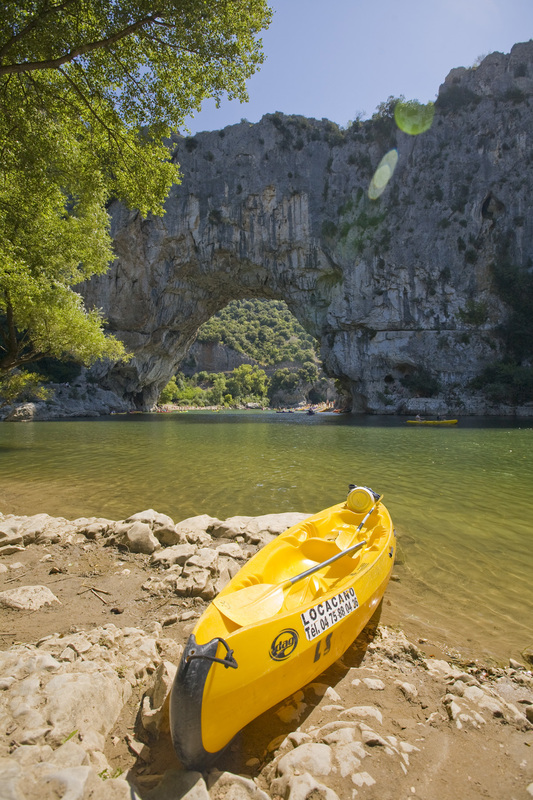 The famous Ardèche Gorge with its spectacular Pont d’Arc is 30 minutes drive away. This gorge is also the site of the recently discovered Chauvet Cave dating back 35,000 years. Other local rivers include the Cèze, Chassezac & Gagnieres. To the south is Montpellier, a lively student city with a spectacular mixture of old and new architecture. The enormous Place de La Comedie has the opera house dominating one end and beautiful gardens with fountains situated at the other. All along the Place de La Comedie there are cafés and restaurants and street entertainment to give a wonderful ambiance. The mediterranean coast just 2hrs drive offers the modern sea-side resorts of Grau du Roi and La Grande Motte with its strange triangular shaped hotels and apartment buildings in contrast to the 12th century town of Aigues Mortes, a walled city dating back to the Crusades. 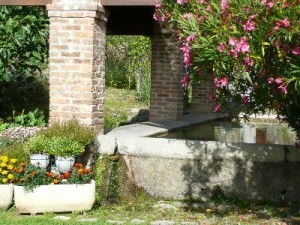 Nearby is the fishing village of Sete, and the Carmargue with its flamingoes and horses. 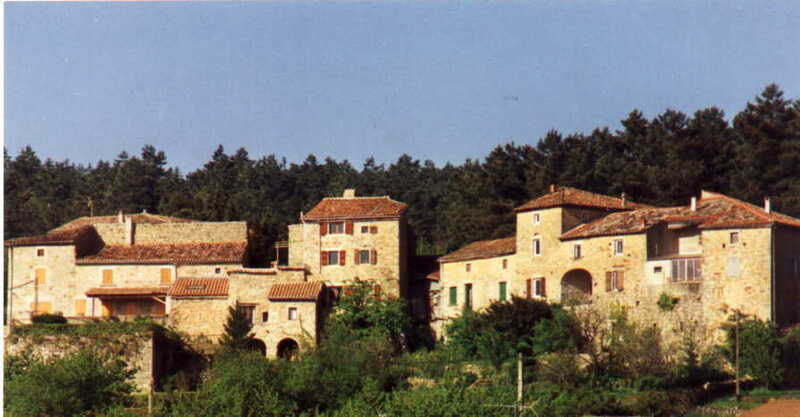 Most local buildings are made of large random stone (gris), a type of sandstone ranging in colour through beige, grey to pink which compliment the pantile roofs. Viewed from above these roofs form random patterns. Skilled masons have often achieved tall, complex structures melting into the hillside. These skills were passed down over hundreds of years. Vaulted cellars were used for the storage of wines as the base of the house would quite often have a one metre thick wall which kept these cellars constantly cool. The small hamlets of a village have an organic nature, old roof lines can often be seen in the walls. During the prosperous period when silk farming was profitable the houses were extended to make space for the industry. The buildings are always full of character with unusual angles inconceivable on the drawing boards of modern architects. Arches are in abundance, often supporting terraces. Wooden shutters at every window are closed tight against the midday sun. Meals are eaten outside on these terraces or in cool enclosed courtyards under clear blue skies. The terraced land is jigsawed by generations of divisions and little gardens appear deep in the forest wherever there is an easy source of water. In the fields the orderly vines look like dark contorted figures during winter, exploding into green at spring-time and turning red and gold by autumn. After offering up their rich fruit in September they are pruned ready for the whole process to begin again. In the surrounding forests the pines remain green throughout winter, but in contrast the sweet chestnut trees create brown and purple patches in the landscape. In February the first signs of Spring appear with the yellow blossoming mimosa followed closely by the almond and the snow-like showers of the cherry. May and June are lush with new vegetation after the spring rains but warm with the promise of summer. In June/July the fields of sunflowers smile out closely followed by the purple haze of lavender. Come July and August work is restricted to mornings and evenings. The middle of the day is reserved for eating and a siesta. Time to search out a place in the shade.